I frequently hear from clients that cost is one of the major barriers to quality content marketing efforts. I understand their concern; quality content isn’t cheap and cheap content usually isn’t quality. However, there are ways to stretch your content dollar, and with good planning you can bring down the cost of quality content to something that’s more palatable. 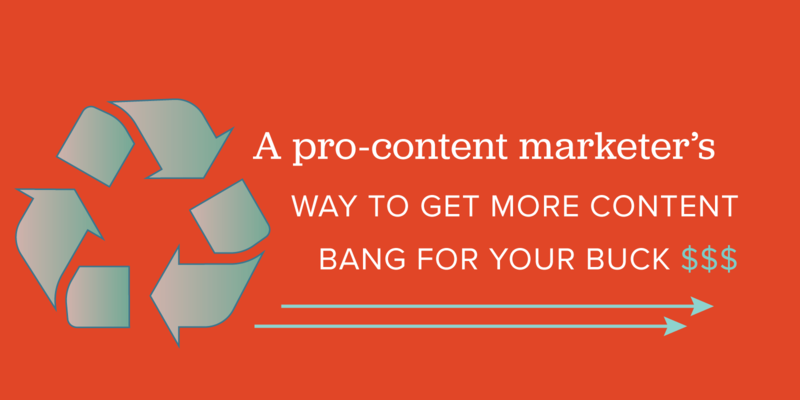 Keep reading for my top tips on getting the most content bang for your buck. A great ebook can supercharge your content marketing, and we consistently see ebooks providing a huge return on investment. But the effort it takes to make a useful ebook can be significant, and this is discouraging to many of our clients. To greatly reduce the cost of your ebooks we recommend “upcycling” blog content into an ebook. Create a plan for an ebook on specific subject and break it down into smaller blog articles. Then write and publish these articles over a period of time. Finally take the best performing blog content and wrap it all up into an organized ebook. This strategy lets you continually get more value from your previous blog posts and makes creating a great ebook simple and fast. Many times the hardest part of content marketing is coming up with great ideas for content. So once you have a good idea, maximize the content you produce from it. For example, make a short video based around your idea with plans to also produce written and audio only content as well. This transcription can be used to create blog posts and other written content. The audio can be repurposed for podcasts. Even the video material it self can be edited into multiple versions for use in different channels. We break this strategy out further in "How to produce a nonprofit video and make it last." Evergreen content is content that had a very long shelf life. In other words, content that stays relevant and useful to your audience over the long haul. Your content marketing strategy should always include a healthy mix of this type of content with more timely or newsworthy pieces. It’s a lot easier to justify the budget for a great ebook or video if you know it’s going to be used for years to come. Just make sure to pick topics and concepts that will stay relevant for a long time. Another great way to produce content for less is to request help from your visitors. With an active blog comments area you may be able to gather enough feedback on topics to distill it into additional content pieces. Many times doing surveys or polls can also lead to compelling infographics and other types of data driven content if you can get enough respondents. Giving away a prize or other incentive can help boost the number of participants. While your VP of marketing may be a good writer, doing regular blogging is probably not the best use of their time. In the new gig economy researchers, writers, designers and other talent can be contracted for very affordable rates. Augmenting your internal team with cheaper external resources can help stretch your content dollars and also provide additional talents you might not be ready to have internally yet. For more insight on this, check out "The dangers and benefits of outsourcing your copywriting." We also have a fun post on the content marketing dream team. If you're on a tight budget, you can still take a look at this and imagine creative ways for your team to cover each role.